Cornish Cruising is a Cornish yacht charter company based at Falmouth Marina, in the spectacular cruising grounds of Falmouth on the beautiful South Cornwall Coast. Cruising from Falmouth is the perfect choice for any ability of sailor; it is the world’s third largest natural deep-water harbour and has numerous coves, creeks and anchorages to explore within easy cruising distance, including Restronguet, Turnaware, St Just and St Mawes. The River Fal will take you past the King Harry Ferry and the Smugglers at Tolverne, straight into the Cathedral City of Truro on an ever narrowing river, passing beautiful scenery and idyllic mooring spots along the way - look out for the various wildlife spotting opportunities on the way, including seals and herons. The Helford River, with its Oyster Beds, beautiful beaches and access to several spectacular gardens, is another area of outstanding natural beauty and is just a short coastal cruise from Falmouth Harbour (always keeping a sharp lookout for August Rock). Tranquil anchorages abound in this part of the Helford, or you can pick up one of the green visitor buoys in the Helford for an overnight stay. Falmouth is an ideal starting point for our many Mileage Building cruises to the Channel Islands, mainland France, Southern Ireland, and the Isles of Scilly. It is also perfect to appreciate the rugged Cornish Coastline by coastal hopping and exploring harbour villages, waterside pubs and quiet anchorages closer to home. 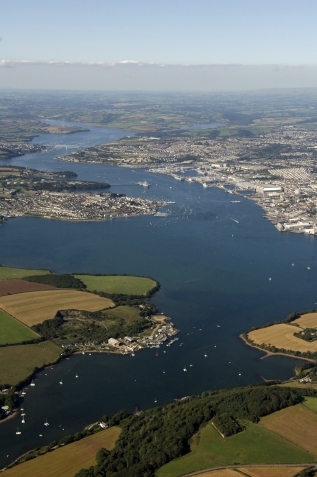 The nautical history that surrounds Falmouth makes it the perfect place to explore on or off the water, plus golden sandy beaches, sub tropical gardens and heritage sites such as Pendennis Castle. The National Maritime Museum is a popular attraction with many events scheduled throughout the year. There is also an annual Oyster Festival, Sea Shanty Festival and in August, Falmouth is host to a week of on and off shore entertainment with Henri Lloyd ‘Falmouth Regatta Week’. So whether you are a sailor who needs a boat, a family wanting a water based holiday, or just want to get on the water, there is always a good reason to book a charter and join in the fun.